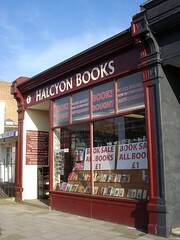 Halcyon Books was a bookshop in Greenwich, just up the road from Greenwich Station. It closed down for good at the end of October 2018, though its other branch in Lee remained open. Bookshop in Greenwich, just up the road from Greenwich Station. Inside, it's a lovely dense collection of mostly second-hand books, divided at just the right level of categorisation. Sections include art, philosophy, history, military, fiction, short stories, gardening, crafts, and biography. They have a decent London section which merits additional examination on Kake's next visit. They also have a couple of boxes of (presumably cheaper) books out the front, but on Kake's visit in June 2008, these were in an appalling state, with books being shoved in any old how, and displaying damage from it. Last visited by Kake, June 2008. Last edited 2018-11-10 16:01:01 (version 4; diff). List all versions. Page last edited 2018-11-10 16:01:01 (version 4).